The trigger assembly is the most important part of the gun according to Ortiz. He uses a Giessele two-stage trigger on his custom AR-15 rifles. Exclusive for AR15.com newsletter subscribers! Enter your e-mail in the box below for a free digital book on AR-15 barrels. You’ll also receive e-newsletters from Gun Digest and partners full of more great information. Pedro Ortiz, a self-taught gunsmith from Savannah, Ga. via Puerto Rico, holds the custom AR-15 that bears his name. The Ortiz Custom Rifle starts with a Geissele two-stage trigger, which Ortiz has further honed and set at 3.5 pounds. Ortiz has for years specialized in trigger work, starting in three decades ago when he modified Model 1911 triggers for most of the competitive shooters in Puerto Rico. The second part of the Ortiz Custom Rifle is a Stoner AR-15 stainless barrel with the popular Wylde chamber. Many shooters like the Wylde chamber because it has a longer throat than the .223 SAAMI spec, which allows safe usage of 5.56x45mm NATO approved ammunition. This match grade barrel features a 1-in-8-inch twist with 5R rifling. The barrel is fluted for greater strength, less weight and accelerated cooling, and is made of 416R stainless. The barrel also features M4 Feed Ramps, a gas port mid-length and is threaded 1⁄2”-28. The customer has the choice of an 18- or 20-inch barrel. To assist in the cooling and handling of the gun, Ortiz selected the Troy Industries Alpha Battle 15-inch free floating rail. This modular handguard is lightweight and slim enough to feel great in the hands of most shooters. The popular rail is constructed of aircraft aluminum and finished with a mil-spec anodized coat. It can accept modular rail sections and can easily accept a number of tactical accessories. With the popularity of the AR-platform rifle these days, you can bet that there are a number of stock options available, too. It is the stock configuration that comfortably allows the sighting eye to look through any chosen optic. 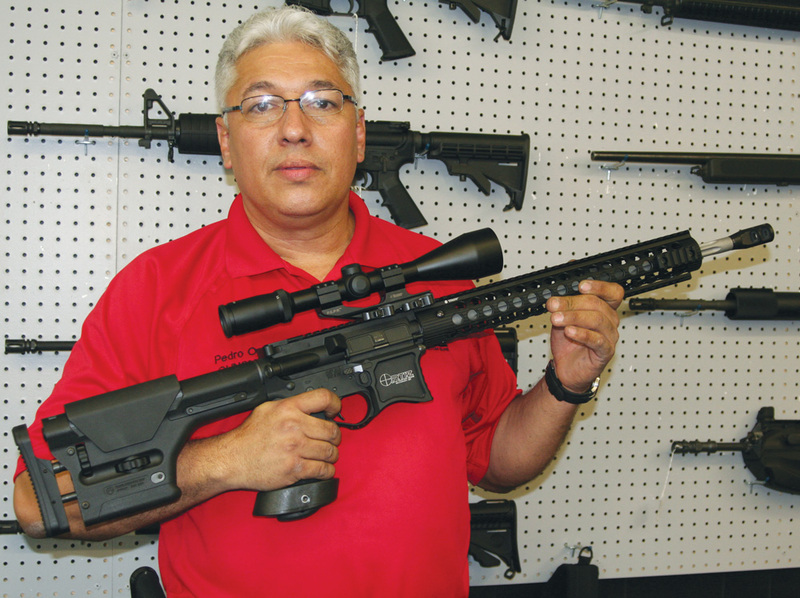 Ortiz selected the Magpul PRS, which is short for Precision Rifle Sniper. This stock is similar to those used on the finest precision target rifles, but is designed to withstand the elements. The Magpul PRS is fully adjustable for length of pull and comb height in order to ensure the best fit possible. The length of pull is adjustable from 1⁄4-inch shorter to 3⁄4 of an inch longer than factory dimensions. The comb height can be adjusted a full 3⁄4 of an inch, which allows an easy comb height fit for shooters of all shapes, sizes and genders. One of the problems AR shooters may one day encounter is a broken or malfunctioning charging handle. Ortiz Custom Guns has addressed this concern by selecting a Vltor BCM Gunfighter Charging Handle for its custom gun. The Vltor BCM Gunfighter handle is machined from 7075 billet aluminum and finished with an anodized hard coat. Marty Fischer is host of the highly acclaimed Shotgun Journal series and is a regular contributor to Quail Unlimited Magazine, Sporting Clays Magazine, Dove Hunter Magazine, Turkey Call, Southern Sporting Journal, Double Gun Journal, Sports Afield, Clay Shooting USA and Grays Sporting Journal, as well as authoring the Gun Digest Book of Shotgunning.